It is a struggle to sit through two hours watching The Pursuit Of Happyness. The film is painful to watch. The movie aimed a sharp arrow right at your heart and there was nowhere to run. 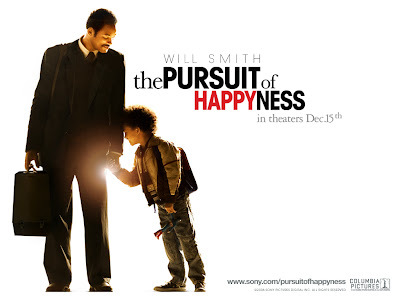 The Pursuit Of Happyness is inspired by the true story of Chris Gardner, a Wall Street legend. In this heartfelt two hours you’ll find Chris Gardner pursuing his happiness as he kept running and running from one part of his life to another. “Happiness” here is spelt with the letter “Y” instead of the letter “I”. Chris Gardner (Will Smith) complains about the spelling of the word that was painted outside a childcare centre where he goes to pick up his 5-year-old son, Christopher (Jaden Smith), in the beginning of the film. Chris Gardner was an unhappy man. He’s a salesman for a bone-density scanner that doctors think it as a luxury medical item and thus his poor sales record. Poor sales mean no money and no money means no love. That is how the story goes. Constantly challenged by the lack of security, Chris Gardner remained strong, largely motivated by his sense of responsibility to his son. Linda (Thandie Newton), his wife has chosen to leave him. Without a shelter over his head and without money in his pocket, he made the biggest decision in his life to go on an internship with Dean Witters as a stockbroker. This is his ticket to a place he calls “Happiness”. To get there though was no walk in the park, Chris Gardner’s character was tested on every level. Often he is seen in a state of desperation and despair, but he never gave up on his dreams. He has a talent, and that talent was perseverance while at the same time he was smart. The only problem was that it was uncertain whether he could rise to that potential. The internship program would take six months, and there was no salary. At the end of those six months only one out of the twenty in the program would be hired. Now, what kind of a person would take such a risk? The answer would be a “Stupid” person. Stupid is not the same as being silly or being an idiot. To move forward, perhaps it is wise to first acknowledge your stupidity. In any good film, there ought to be a defining moment. Is this movie any good? It’s good. Period. sappy movie. i cried watching it. jaden smith is so cute too.